The Pink House Cricut Swarm: Christmas in July at The Pink House! Christmas in July at The Pink House! We are excited to introduce our newest instructor. Tina is a talented and fun crafter. You will enjoy learning techniques and tips from one of the best. Come see Tina during our Christmas in July celebration on Friday the 24th and Saturday the 25th. Check out the Calendar for schedule and class fees and be sure to call ahead and reserve your spot and kit. And don't forget to sign up for the all night pajama crop on Friday. Call us for all the fun details. This is a really adorable make-n-take that Tina has prepared for you. These mini ornaments are fun to create. You will be using our newly arrived Christmas paper (different than shown) to make your very own. How sweet it is!!! 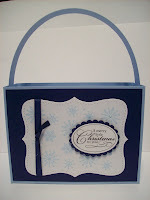 This cute little candy holder is one of 3 gift ideas that you will make in this class. Who doesn't like candy presents? It takes all the guilt out of eating chocolate when it's a present, right? You'll have to come in and take a look at this trio. You have to come see me anyway to check out the new product we are receiving all week. The Mom says! Speaking of gifts...Tina has outdone herself with this desk set. 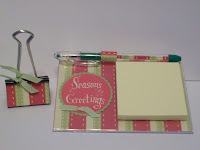 She'll show you how to make a presto-chango desk stand that can be enjoyed all year. There is a third piece take-a-long to complete the set that I'll have to show you when you come in to see me.